There is one object in PowerShell utilized for making connections as a separate account: PSCredential. This object is used to capture the new credentials. In most cases it allows you to securely pass in those credentials without making the account information visible in your script. In the examples below I am just going to use the “Get-Credential” command to build this object. The article referenced at the end of this article for securing your passwords in PowerShell goes over this command and others in more detail. While SQLPS is still around a better module that Microsoft released with SSMS 2016 was renamed to “SqlServer”. This module is being expanded upon as SSMS updates are released so is more robust that SQLPS module. The methods shown below would work with either module though. SQLPS.exe, the utility, is not going to be touched on because it does not support changing the account before you connect. When you open that utility you are placed directly into the “SQLSERVER:” provider, without being able to change the account. The provider itself though, can be adjusted to use a separate account. If you have used the file provider in PowerShell to connect to remote shares (equivalent to”net use“) it works the same way. You will notice that the command “Invoke-Sqlcmd” is not listed. The “Invoke-Sqlcmd” command does let you pass in a username and password for a SQL Login, but only in plain text. 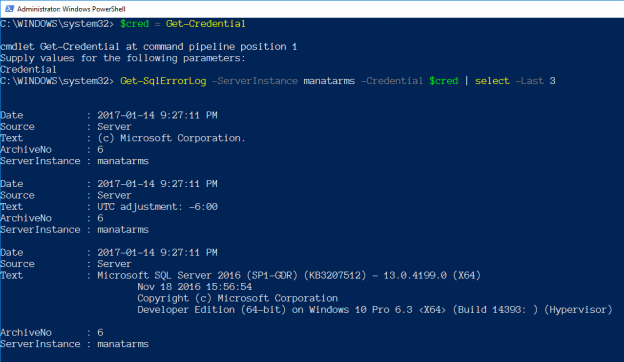 The commands that do support the credential parameter have the same limitation as the provider, only accepting SQL Login authentication. Once you have the server object create we work out passing in the account desired, based on which type is needed. We can then pass in the username and password from the credential variable and connect. Isn’t that much easier to use? SqlClient only allows a SQL Login account to be provided. Which is expected as .NET utilizes the login that initiated the process for Windows Authentication. To utilize a SQL Login account we need to build a specific credential object, System.Data.SqlClient.SqlCredential. You have to pass in the username and the password (as SecureString). There is one extra thing required for the password. The SqlCredential requires that the password is read-only, so it cannot be altered once the connection is made. Which means once you set it as read-only it cannot be reverted, you would have to rebuild the object. Any attempt to modify that password will give you an invalid exception error. As you probably noticed, SQL Login gets the most support in the options above. If you need to use Windows Authentication you have a few options but for the most part will need to start PowerShell as the needed Windows Account. PowerShell offers multiple options for connecting as a different Windows Account that are not directly related to SQL Server, if SQL Login is just not an option. You can look into commands like “Invoke-Command” or “Start-Process”, these provide an option to also pass in a Windows credential. I hope the above information provides some help in better understanding using alternate credentials to connect to SQL Server.